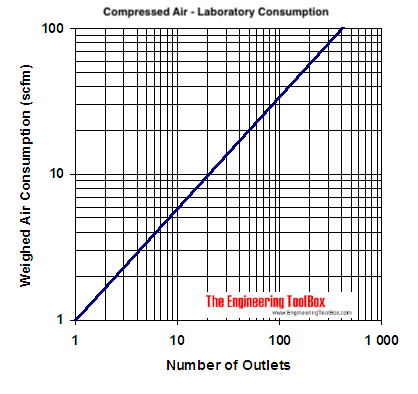 The typical total demand for compressed air in laboratories due to diversity and simultaneous use are indicated in the diagrams below. All outlets for compressed air are newer used at the same time. For a laboratory with 10 outlets the compressed air supply should be sized for a capacity of 3 nl/s. Engineering ToolBox, (2008). Compressed Air - Laboratories. 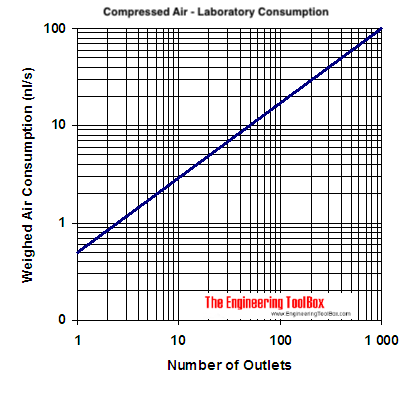 [online] Available at: https://www.engineeringtoolbox.com/compressed-air-laboratory-demand-d_1196.html [Accessed Day Mo. Year].